At Robinson’s Shoes, we specialise in luxury handmade shoes for men and women that we believe are truly the best available. So, it should be no surprise that stars from the sports and entertainment industries come to us when they want only the best footwear, as well as the star treatment by calling in to our Carrickfergus showroom. While bespoke shoes can start from around £2000, a pair of hand-finished quality brogues start from a much more reasonable £200, and even though some stars have unique and exacting tastes, Robinson’s Shoes owner Robin Stewart can testify that even the biggest celebrities still appreciate the quality and craftsmanship that goes into the shoes sold by Robinson’s. So much so in fact, that he has seen quite a few famous faces back time and time again over the years to his showroom to make further investments in their shoe collection. 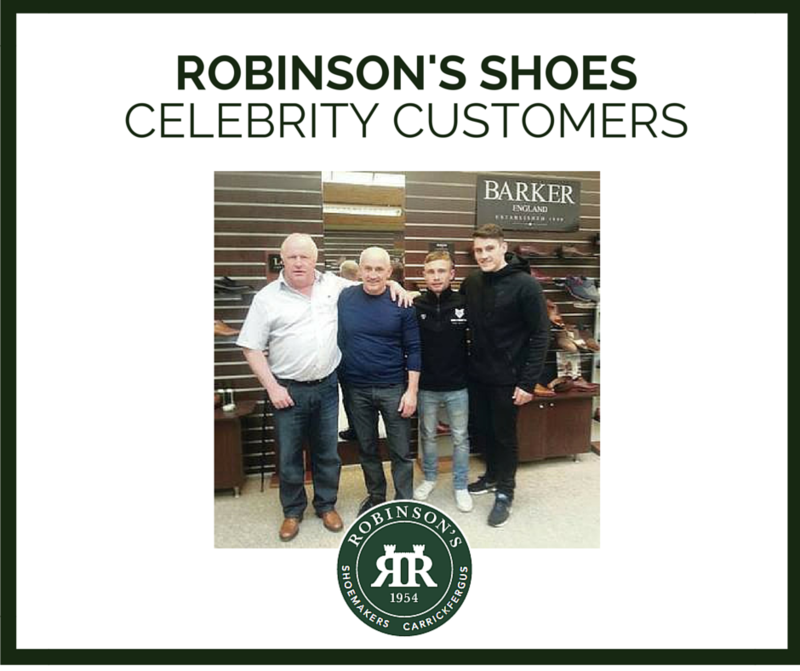 One such patron is Belfast-born boxing champion Carl Frampton, who loves his Barker shoes, and even commented that ‘they’re the most comfortable shoes I’ve ever worn’. He also discovered that, like most men, he’s not wearing the right size of shoes, and after the expert fitting service offered in Robinson’s Carrick store, he went from a size 8 to a 6.5 and has never looked back. Robinson’s are also proud supporters of the Ulster rugby team, and are the official footwear supplier to the entire squad for another year. Darren Cave had a great time trying on multiple pairs during his visit to the Carrickfergus showroom, before settling on a pair of Barker shoes with a perfect fit. He’s confident that his new footwear will take him comfortably from the rugby pitch to a fancy restaurant for dinner with friends. Treading the boards is done oh-so-stylishly in footwear from Robinson’s by Ulster actor Ian McElhinney, who has found fame on acclaimed series Game of Thrones. This particular celebrity customer found it hard in the past to get footwear that fitted, but after a visit to us, Ian thinks his new tan brogues are to die for and give his feet great support. We 100% agree with his comment, that when you put on a good looking and well-made shoe, you just feel great. If you’re ever in the Carrickfergus area, call in and talk to the experts in store who can help you find your perfect fit and the perfect pair for you. If it’s not convenient, you can always browse the range online here and enjoy your shoes with free delivery worldwide on orders over £150.